Animation can be used for several different purposes such as movies, advertisements, video games, corporate presentations, medical concept demonstrations and much more. Not all of these require the same animation quality level. 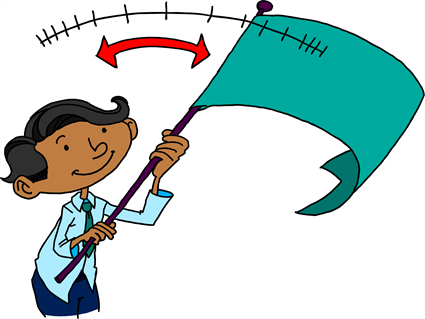 To illustrate a concept, simple and linear animation is often more than sufficient to convey the message. For a feature length animation movie, the animation needs to be convincing and carry some weight and elasticity. You will notice when you watch different movies that the animation style will differ quite a bit from film to film. 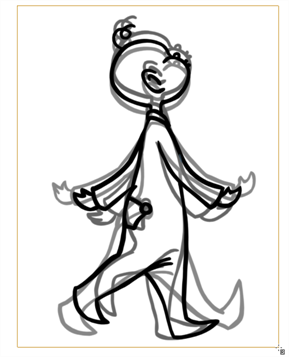 Some have a very fluid and smooth flow in their animation while others have a very bouncy, cartoony feel. People without animation experience may watch a movie and find the animation very bad, unconvincing or too slow. They might not know why exactly, but they know that something isn't right. Most of the time, it happens because the animators missed a few of the fundamental animation principles. If you already are an experienced animator, you can skip this topic and continue along. 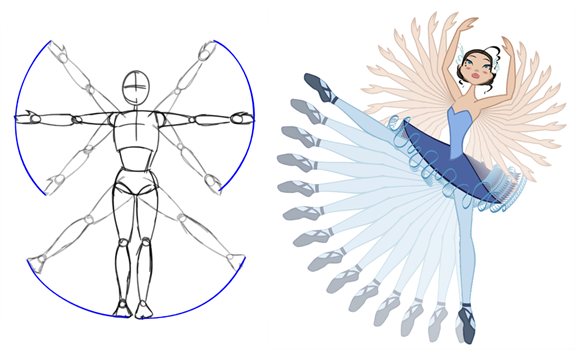 Here are the main principles that create the backbone of a good animation. You will no doubt encounter variations of these principles when reading articles online or reading different books. Squash and stretch is at the core of the animation principles. 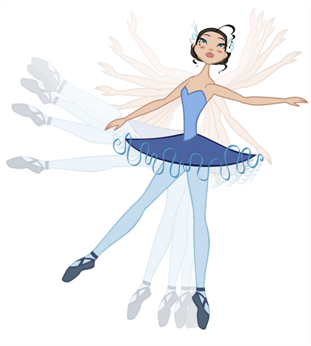 It is what gives some elasticity and flexibility to your animation. When an object hits the ground, the impact drawing will be really squashed. As it bounces off the ground, it will stretch in the opposite direction. The stronger the squash and stretch is, the smoother and bouncier the animation will look. Also, hard objects such as a bowling ball require less squashing or stretching so that the heavy and solid illusion remains. As you squash and stretch an object, it is really important to maintain the volume of the object. When you squash something down, you need to proportionally stretch it sideways, otherwise, the object will look like it is getting smaller. Anticipation is the preparation for an action such as a jump or a punch. For example, a character will squat down before pushing his body and legs up into a jump. The stronger the anticipation motion, the more cartoony and fluid the animation will be. The smaller the anticipation, the more stiff the animation will be. These are two different ways to animate an action. The straight-ahead technique means to animate your action from drawing 1 to the end in sequence order. 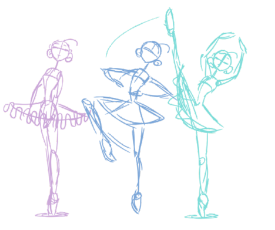 The pose-to-pose technique is a bit more intricate as it means to draw the key poses first (often the beginning and end drawing of the action and some other key moment between. Once the key poses are done, the breakdown and inbetween drawings are added to fill the rest of the animation. Smoke, water and other fluid elements are often animated using the straight-ahead technique. Actions that require tight timing and structure are often animated with the pose-to-pose technique. This method helps maintain a solid structure and preserve the volume. Sometimes, when using the straight-ahead technique, it may be difficult to calculate where the action will end up and the final drawing may be out of proportion and not where it should be. The Follow-Through principle is very important for increasing the quality of your animation. All the secondary parts of your character such as hair, clothes or a cloak will continue moving after the character stopped moving. Also if you observe closely, when a character walks, its body moves and down, and its long hair or cloak follow behind on the same path but with a slight delay. Therefore, your character might be at the lowest point in a crouching action but his cloak will be all the way up in the air. Also, notice that when the cloak floats behind the character, it will move along an "S" curve. The part of the cloak that is attached to the body will not always curve in the same direction as the tip of the cloak. The human body moves from its articulations such as the shoulders, knees, hips and elbows. Therefore, all limbs move by rotating on their pivot (articulation). 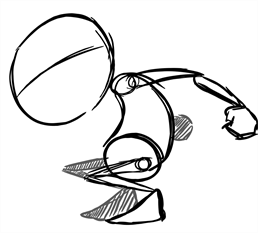 When animating an arm going up or down, the hand will not reach its end point on a straight trajectory. It will follow an arc until it reaches its end point. Most characters and objects accelerate and decelerate when moving. Most movements are not linear, therefore to reproduce the slow-in and slow-out effects, we add more drawings closer together at the beginning of the action and same at the end of the movement. The closer the drawings are, the slower the animation will be. The farther apart they are, the faster the animation will be. Secondary actions add another layer of realism and quality to an animation. The secondary actions are the other limbs or objects moving along with the main action. They are not the follow-through actions, which are inanimate objects reacting to the main actions. They are the limbs that move, such as the character's arms swinging rhythmically back and forth when walking. He could nod in time to music while taking a stroll or blink or chew gum. The principle of exaggeration is another important way of adding life in animation. Sticking exactly to reality will make for a very stiff animation. 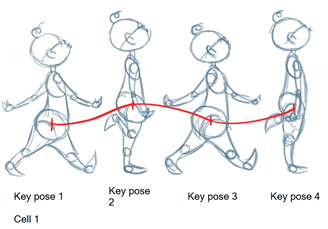 Changing the direction of the main body curve from backward to forward in a dramatic way, using squash and stretch, snappy timing and good slow-in and slow out help exaggerate the movements and add life to your animation. 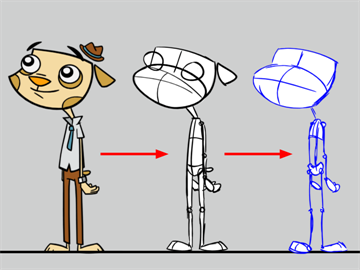 In animation it is paramount for drawings to have a strong underlying structure. The animator must understand the anatomy and skeleton of the characters and props to be animated. Without a good structure, the drawings will deform, bend in the wrong places, and progressively become off model. The animator should always know what is under the skin of his character.